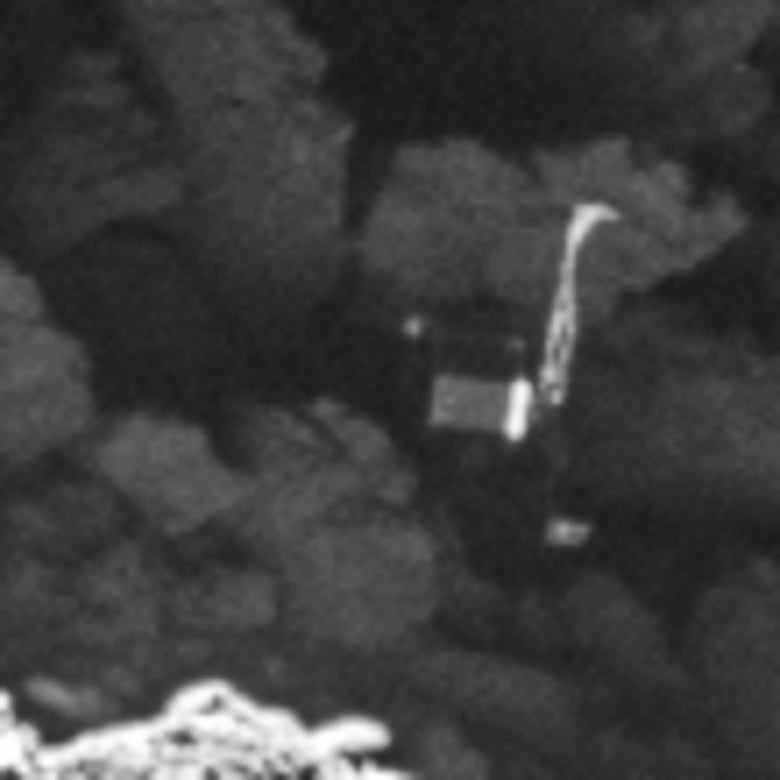 The Philae lander, the first spacecraft to land on a comet, has been spotted in a dark crack on the side of a comet. The probe touched down on the comet in November 2014, but bounced twice, making it challenging for scientists to know its exact location, until now. The European Space Agency's Rosetta spacecraft's OSIRIS camera captured an image of the probe on the rocky surface of Comet 6P/Churyumov-Gerasimenko last Friday. "This remarkable discovery comes at the end of a long, painstaking search," says Patrick Martin, the ESA's Rosetta Mission manager. "We were beginning to think that Philae would remain lost forever." The camera took images of the probe — which is one metre wide and one metre high, with a mass of 100 kilograms — from 2.7 kilometres away. Philae sent data to Earth for three days before its battery ran out and it went into hibernation, only to recharge enough to communicate briefly with Rosetta in mid-2015. But the team officially called it quits on Philae in July 2016, shutting off the communication link between Rosetta and Philae in an effort to conserve Rosetta's energy. 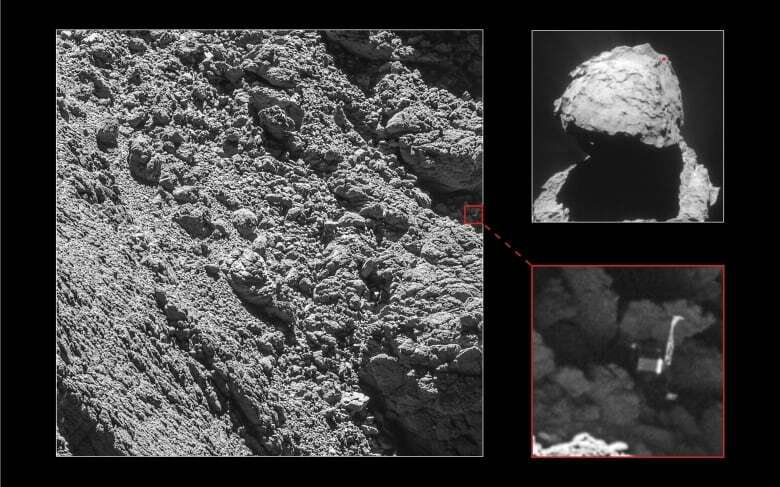 The team said knowing Philae's exact location means they can put the data it sent into context — part of the lander's job was to analyze samples of the comet's surface. 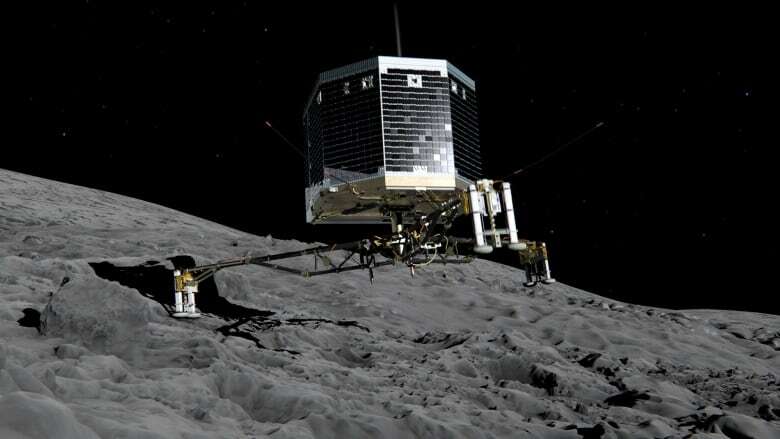 They also know why communication between Rosetta and Philae was a challenge — the lander has been stuck in a cliff wall with its solar-powered batteries in the shade. Philae and the Rosetta spacecraft have been in space for more than 12 years. Their goal was to take photos of the comet and send data back to Earth in hopes of learning about how the planets, and possibly even life itself, evolved. The ESA plans to crash-land Rosetta onto the comet on Sept. 30, because the craft is unlikely to survive lengthy hibernation in orbit as the comet heads away from the sun. "Now that the lander search is finished we feel ready for Rosetta's landing, and look forward to capturing even closer images of Rosetta's touchdown site," adds Holger Sierks, principal investigator of the OSIRIS camera. Once Rosetta lands on the comet on Sept. 30, it, too, will be retired and all communications with Earth will stop.